Want to make a printable monthly calendar using your very own photos captured at some special moments? Want to create customized events on your printable monthly calendar? Well, choosing a gorgeous calendar template makes it easy. 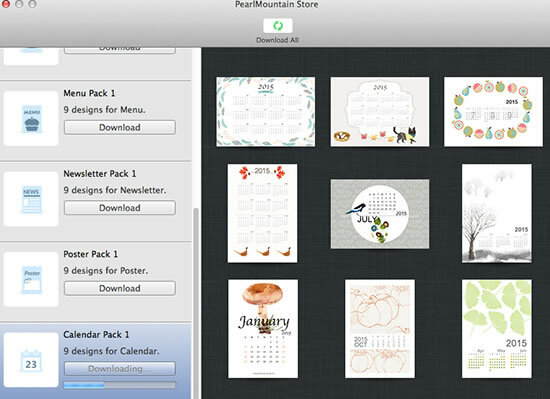 You can try these beautiful calendar templates in Publisher Plus for Mac. 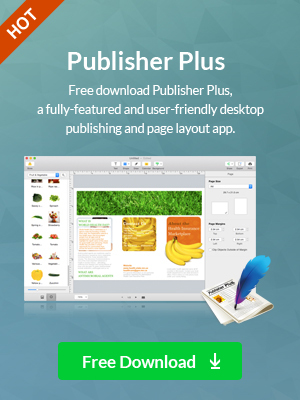 Open Publisher Plus for Mac and go ahead to enter the editing mode by selecting a blank template. Here at the top left of the window, you can see a Store button. Click on the Store button, a window with a lot of free templates pops up. Browse these template packs and click download button below the Calendar Pack 1 to download the 9 calendar templates for free. Once you downloaded the templates, use the short key (command + N) to check those templates in a new window. 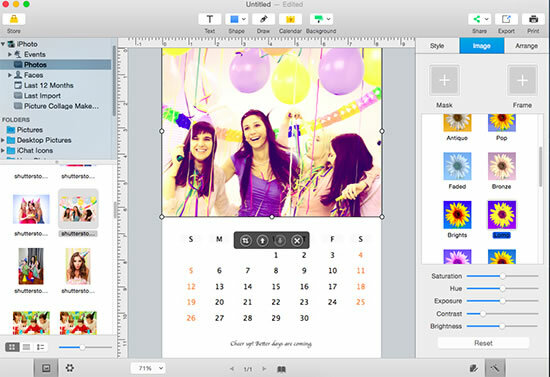 Then, choose the favorite calendar template to start your monthly calendar. You have the choice to set the page size of the calendar by clicking the page icon at the bottom of the window or make a customized size using the Page Setup… option under the File menu. It depends on your own needs. When comes to calendar object, you are free to customize its properties as well. 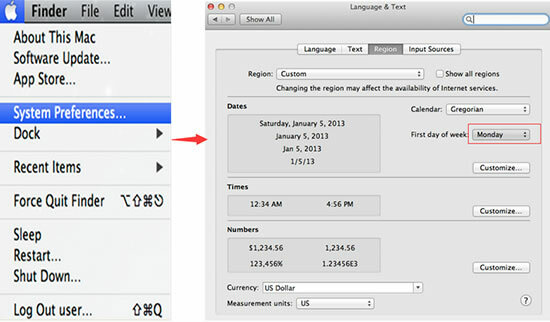 Select the calendar object and you are free to set the font of the calendar as you want. Besides, colors of the Year, Month and Day can be freely edited under the Calendar tab. Here we set the First Month to April, Month Count as 1 for the monthly calendar. With each option below, you can change the background color as well as the text color of the calendar easily. Additionally, the language of the calendar will be automatically configured according to the language on individual computer. If you have a day in mind and want to set it as the first day of week, you can follow these steps. Click System Preferences... in the Mac system menu. Then choose Language & Text, and choose Region option. For example, set "First day of week" as Monday. Usually the default setting is Sunday, so the weekend days you see are Sunday and Monday. After correcting this, the weekend days in calendar will Saturday and Sunday. You can add your photo from the left photo list or simply drag and drop your photo into the calendar. 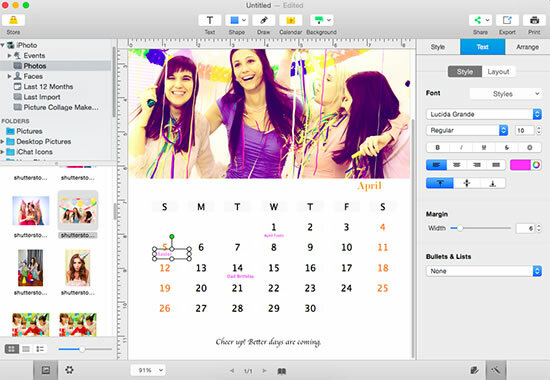 Then, rotate, resize, crop, or enhance the picture with the color adjustments to best fit your calendar. It is possible to add your own events to the calendar with the handy text tool. Click Text button to add some specific personal dates, including birthdays, anniversaries, holidays, and other significant events. Not sure when Easter falls this year? Add the event on your calendar. 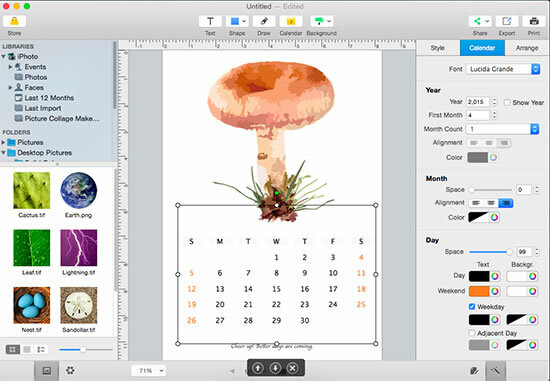 Once your monthly calendar looks fine, it's time to print. 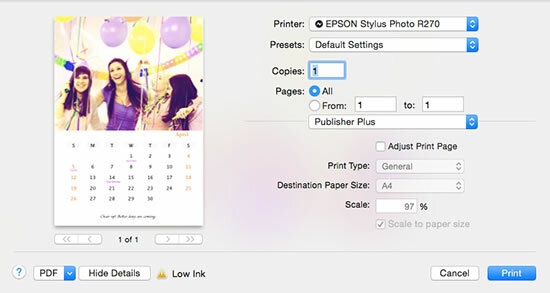 Click Print button to print the calendar directly. Make print settings such as Printer, Copies and Pages, etc. to suit your needs. A printable monthly calendar with your own photos and customized events would be a beautiful gift that everyone will appreciate. It is really a very nice way to share special memories with family and friends as well. So why not try to create a printable monthly calendar now?